Why are communities vulnerable to expropriation without fair compensation? For centuries, Indigenous Peoples and local communities have held, used and depended on their land for food, shelter, traditional practices, and other basic needs. Historically, community land was commonly governed under customary tenure systems, which have long standing origins in the norms and practices of the community and often go back centuries. Meanwhile, governments often considered community land areas as vacant, idle, or terra nullius (i.e “nobody’s land”). Under the Doctrine of Discovery, invoked by colonial powers to justify encroachment on community land, colonial rulers could claim so-called “vacant land” if they were the first to “discover” and document it. To this day, in Asia, Africa, Latin America, and other parts of the world, failure to recognize community land rights has caused conflict, human rights abuse, and environmental harm. 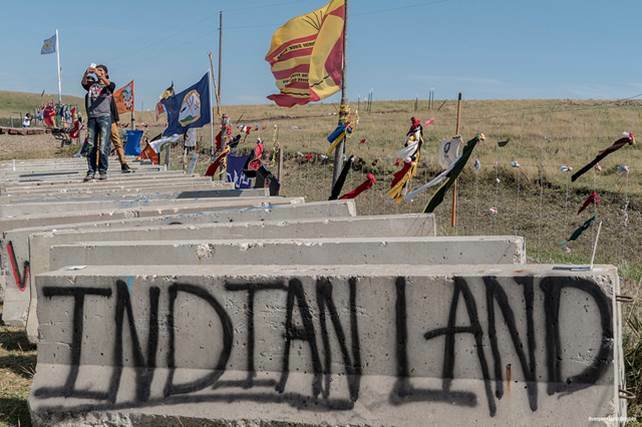 Currently in the US, for example, Native Americans are protesting the development of the Dakota Access Pipeline since the pipeline infringes on their rights to sacred land and water bodies. Securing community land rights is not only crucial from an economic, human rights, and conservation perspective, it is also necessary to ensure Indigenous Peoples and local communities are adequately protected when land is acquired by governments in a compulsory manner. To secure community land tenure, laws should appropriately limit expropriation power so that community land is only taken as a last resort and if absolutely necessary to achieve a genuine public purpose. Without effective legal measures to check expropriation power, government officials may abuse their authority, and arbitrarily eliminate or restrict land rights even when doing so does not serve a genuine public purpose. Under such circumstances, Indigenous Peoples and local communities are at risk of losing their land rights even when no public benefit is generated from the compulsory acquisition. Laws must also ensure Indigenous Peoples and local communities are eligible to obtain fair compensation---either in suitable alternative land, money, or other negotiated compensation-- when their land is taken to serve public purposes. When governments decide to compulsorily acquire land to serve public needs, compensation procedures established in laws may only grant compensation to private property owners and others with statutorily recognized tenure rights. Under such legal regimes, communities who hold land under customary tenure without statutorily recognized rights may be effectively precluded from submitting claims for compensation. Communities are more vulnerable to expropriation without fair compensation if governments consider them as permissive or informal occupants or users of “state-owned” land. If communities with unregistered tenure rights are evicted without fair compensation, they may subsequently fall into extreme poverty, suffer health problems, and endure other consequences such landlessness and cultural extinction. In Nigeria, for example, the Lagos state government pushed affected communities off their land without compensation in 2013, according to a report by Amnhesty International. The government stated in its project plan that it did not want to set a precedent whereby "illegal occupiers" of land without development permits have to be paid full compensation upon eviction. Furthermore, a Global Land Tool Network (GLTN) study on expropriation, eviction, and resettlement practices found that compensation was often not provided to affected communities in Nigeria, Indonesia, Cambodia, China, and Sri Lanka because governments refused to recognize their tenure rights. As a consequence of expropriation without compensation, many of these communities became homeless, experienced income loss, and suffered other negative consequences. Legal hurdles to obtaining compensation are potentially very problematic given that, globally, up to 2.5 billion people hold land under customary tenure. In Africa, it is estimated that 625 million people are customary tenure holders, and that 90% of rural Africa is undocumented and informally administered. For my PhD research project at the University of Groningen Faculty of Law, I assess a broad range of national-level statutes, regulations, and court decisions against a set of indicators that are based on Section 16 of the VGGTs. Section 16 establishes international standards on expropriation, compensation, and resettlement. It is important to note that my data is based on desk-review of relevant laws, and does not comprehensively assess how laws are implemented in practice (for more info on the caveats of this research, see Encroaching on Land and Livelihoods). To assess community compensation rights, I use LandMark's legal indicators on the tenure security of indigenous and community land, in conjunction with the expropriation data collected for my World Resources Institute/University of Groningen working paper entitled Encroaching on Land and Livelihoods. The data is cross-checked for accuracy against the relevant World Bank Land Governance Assessment Framework indicators. Overall, VGGT indicators examine whether government authority to acquire land is limited and local land rights are protected. The indicators measure national laws on a scale from A to C.
“C” means no adoption of the VGGTs based on the legal provisions assessed. The data used to generate these findings is available and displayed on a new infographic on Land Portal's Land Book country pages. The infographic also provides an explanation of the indicator scores and citations and links to the relevant laws. On India's country page, for example, users are provided with a direct link to India's LARR Act, 2013 and the Forest Rights Act, 2006. Clear Conceptualization of Public Purpose: Four of the 30 countries assessed (Cambodia, India, Indonesia, and Mongolia) achieved a score of A because their national laws adopt VGGT Principle 16.1 by providing clear definitions of public purpose to allow for judicial review. Ten countries received a B (partial adoption) score because national laws in these countries partially define what constitutes a public purpose (see Encroaching paper for more detail). Sixteen of the 30 countries assessed received a C (no adoption) score, meaning laws do not adopt the VGGT principle. In these 16 countries, “public purpose” definitions are either vaguely defined or grant executive authorities (e.g. the President or Minister of Land) broad discretion to interpret what constitutes a “public purpose.” To see country-specific scores, and an infographic with explanations and citations to the relevant laws, see Land Book country pages. Minimum Amount of Land Necessary: In three of 30 countries assessed (India, Malaysia, Taiwan), the government is legally obligated to only acquire the minimum amount of land necessary to achieve a public purpose. These three countries received a score of A (full adoption of Voluntary Guideline Principle 16.1 based on the legal provisions assessed). In the other countries assessed, the law does not ensure that governments will only acquire the minimum amount of land necessary to achieve a public purpose. Compensation for Registered Customary Tenure Holders: Of the 30 countries assessed, 22 have laws that provide compensation for formally recognized customary tenure rights held by Indigenous Peoples and local communities. In the other seven countries--- Afghanistan, Bangladesh, Kazakhstan, Hong Kong, Mongolia, Sri Lanka, and Thailand --laws do not ensure that customary tenure holders are legally entitled to compensation upon expropriation. Compensation for Unregistered Customary Tenure Holders: Only 5 of 30 countries (Philippines, South Sudan, Tanzania, Uganda, and Zambia) achieved a score of “A”. In these countries, compensation may be provided for community tenure rights regardless of whether those rights are formally registered. Six of the 30 countries (Burkina Faso, India, Liberia, Rwanda, South Africa, and Vietnam) received a score of B (“partial”) for this indicator because their national laws contain provisions indicating that some (but not all) communities may be afforded compensation even without obtaining formally registered land rights. Registration processes can often be difficult to access, time-consuming, and expensive for communities. Registration requirements usually stipulate that communities must demarcate clear boundaries around their land, establish new governance structures (e.g. corporations or associations), obtain approval from land surveyors, and fulfill other cumbersome tasks. In Peru, for example, Indigenous forest communities must clear 27 bureaucratic hurdles to achieve official recognition and formal land titles; this process can take more than a decade, according to the Rain Forest Foundation. Until registration is complete, many Indigenous Peoples and local communities in the other countries remain vulnerable to expropriation without fair compensation. Compensation for Undeveloped Commons Held By Customary Tenure Holders: Thirteen of 30 countries scored an “A” because their national laws grant compensation for undeveloped common properties (e.g. pastures, hunting areas) formally recognized as held by Indigenous Peoples and local communities. In other words, compensation for customary tenure rights in these 13 countries is not limited to improvements made on the land. In the other 17 countries assessed, compensation may not be provided to communities unless they have developed, improved, or cultivated their land. Across Asia, Africa, and Latin America, there are millions of hectares of grasslands, woodlands, wetlands, deserts, pastures, and other undeveloped commons, which communities use for grazing livestock, hunting animals, and other livelihood needs (e.g. burial grounds). Without statutorily recognized rights to compensation regardless of whether the land is developed or cultivated, communities who customarily hold and use undeveloped commons may be not be compensated when land is taken for public purposes. A forthcoming paper analyzes these findings. This paper will be published on Land Portal and presented at the Rethinking Expropriation Law’s Conference on Compensation for Expropriation (in Cape Town Dec. 7-9) and at the World Bank Land and Poverty Conference 2017. To contribute a Land Debate on land valuation and fair compensation, click here. The VGGT dataset and infographic on Land Portal presents an innovative new method for assessing national laws against international standards. Over the next two years, I will continue to post new indicator data that can be viewed and analyzed using the VGGT infographic. While this data is limited to expropriation, compensation, and resettlement procedures, the long term goal of Land Portal is to mobilize resources to collect and disseminate data on other sections of the VGGTs as well as the land-related Sustainable Development Goal indicators. On behalf of the Land Portal team, I truly hope you find this data useful and welcome your feedback on how we can continue updating and improving the VGGT data and infographic on Land Portal.